Always should the domains of the physical (electro-chemical) and the mental response to environmental stimuli be differentiated, and in turn must they all be recognized as phenomena apart from spiritual activities. The domains of physical, mental, and spiritual gravity are distinct realm of cosmic reality, notwithstanding their intimate interrelations. It has been stated in the previous Papers that the physical chemical elements are the principal factors in the formation of the inorganic and organic matter, and are the prerequisite forms of matter necessary for the formation of the mechanical (non-teachable) mind, pre-life mind, and the teachable (non-mechanical) mind of the planetary life evolving through the planetary physical life-wave stages from the basic elemental reactive consciousness to its ascending super-human mind potentials. The beginning of the teachable (non-mechanical) mind begins with the introduction of the Life Spark and the Life Force through Life Carriers by Local Universe Creator Daughter (in case of this planet Urantia it was Nebadonia, see previous Papers on www.LighttoParadise.com) and the extension of the Life Force through the central PUMA holographic vortex of the first such electro-chemical cells via cosmic stations lines and the precipitation of the first biological material, such as primordial DNA, in the formation of the first electro-chemical biological cells of life. First primordial cells were simple and undifferentiated electrochemical circuits, established only from the reactive inorganic atomic-molecular components into which the life germ plasma was introduced with its ability to bridge the frequencies of the adjacent spheres of consciousness surrounding the solar cell nuclear ego-centric self. In the development of any planetary life the vegetable always precedes animal and develops fully before animal patterns appear and begin to differentiate. All animal types always develop from the basic patterns of the preceding vegetable kingdom; they are not separately organized. Holographic vortex interference patterns are induced by any of the above mentioned type of the PUMA holographic vortex based minds, i.e. the mechanical (non-teachable) mind, pre-life mind, and the teachable (non-mechanical) mind of the planetary life evolving through the planetary physical life-wave stages from the basic elemental reactive consciousness to the ascending super-human minds. 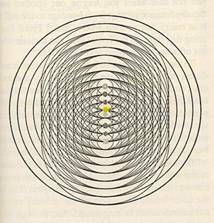 Picture 1 is the example of the seven centers/wheels holographic vortex mind interference pattern (“the ripple effect”) such as the one of the human energy body. 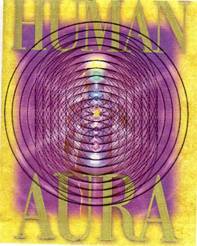 Therefore, the seven human chakra centers/ wheels mind holographic vortex interference aura “pattern would appear as presented below in Picture 4. 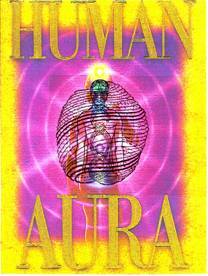 When seven basic human chakra centers/wheels are presented within the body of the expanding central Physical UltiMate Atom (PUMA) located in the time-space “secret chamber”(Sanskrit Ananda-Kanda ‘the root of joy’) of the heart, then the human body holographic vortex interference aura appears as in Picture 3. “The chakras are vortexes which are essentially energy. And inasmuch as any real religion incorporates divinity in all its aspects, this Sanskrit system of identification with the divine was always regarded as a spiritual practice, as well as a helpful discipline, and so it weighs toward the side of spirit but we cannot overlook the physical aspects of the life we live. The addition of the dimensions of the seven planetary epochs en route to light and life(* 6), is yet another general overview to push the limits of your mental walls outward so as to enlarge your scope of human evolution, for this additionally yields insight into your arena, which is the earth on which you are living and working on behalf of truth, beauty and goodness. For you certainly have your insights which have been garnered from your personal experience, but the broader you can press for experience, that is to say, as much of your consciousness as you are capable of contributing, you cannot help but bring greater dimension to the consciousness of the general level of consciousness on the world at the moment, at this time. But I want to stretch this picture so far as to allow for there to be a pivotal point right here: at the heart. The heart is where your loyalties lie. It is from the heart your depiction of reality will generate. Whatever it is that you love, you will represent because of this chakra. This is what you know; this is your knowledge. …Mind is the technique whereby spirit realities become experiential to creature personalities. And in the last analysis the unifying possibilities of even human mind, the ability to co-ordinate things, ideas, and values, is super-material. *6 The seven planetary epochs are an evolutionary system of gradation from a purely material level to global enmeshment with spirit reality.